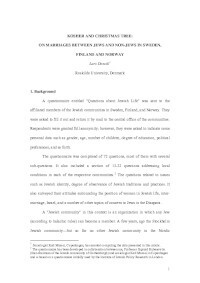 Through a survey of affiliated Jews in Scandinavia, the author provides demographic information about attitudes towards intermarriage, rates of intermarriage and marriage to converts, and the ritual religious practices of intermarried families compared to in-married families. Jewish community size seems to be the strongest factor in predicting the acceptance and practice of intermarriage. The download and abstract for this record are from a 2003 version of this paper, held by BJPA.